Human heart has three main coronary arteries. When the blood vessels supplying blood, oxygen and nutrients to the heart gets damaged or plague gets build up in arteries or there is inflammation in arteries, it leads to coronary artery disease wherein the arteries get narrowed thereby decreasing the blood flow to the heart. Depending on the number of vessels that are narrowed, one has single, double and triple vessel disease. Critical narrowing of the arteries leads to angina or chest pain and shortness of breath. This usually occurs after physical activity or due to stress. A complete blockage leads to heart attack. It is more common in males than in females. It is a chronic disease. The main cause of triple vessel or three vessel coronary artery disease is atherosclerosis which is a condition in which cholesterol accumulates in the artery walls, resulting in abnormal and gradual thickening of the lining of the heart arteries, causing the blood flow to be restricted. According to Ayurveda, heart problem is termed as Hrid Shula which means pain in and around the heart. It is due to Vata imbalance. Smoking, diabetes mellitus, hypertension and high blood fat levels or cholesterol levels are the main causes of coronary artery disease. A diet low in antioxidants, rich in saturated fats leads to blockage of arteries. Lack of exercise or sedentary lifestyle, stress, alcohol also contribute to the problem. Sleep apnea, high triglyceride levels, high sensitivity to C reactive protein may also lead to triple vessel disease. Age is one of the cause too especially after the age of 40. The symptoms are usually visible in advanced stage of disease. 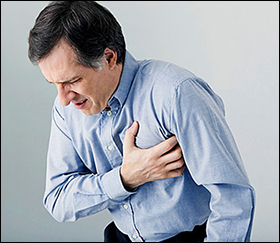 Chest pain spreading from left arm or neck, back, throat or jaw, shortness of breath, palpitations, giddiness, cold sweaty hands etc are some of the visible symptoms of triple vessel disease. Some complain of numbness in arms, shoulders and wrists. Vertigo and dizziness, nausea and vomiting, weakness, cold feet, loss of appetite, heartburn, loss of vision on one side , trouble during climbing heights or steps , getting emotional and irritated are other less common symptoms of triple vessel disease. Feeling of heaviness or someone squeezing the heart is another common symptom. Electrocardiogram, Echocardiogram, exercise stress test, nuclear scan test, stress thallium tests and cardiac catheterization or angiogram and CT scan are some of the ways to determine blocked arteries. Medicines aim at lowering the cholesterol levels and thereby decreasing the strain on the heart. In extreme cases, the affected arteries are reopened using an angioplasty and rerouted using cardiac bypass surgery. 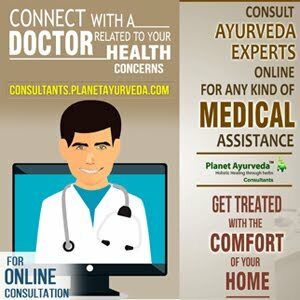 Ayurvedic treatment for triple vessel disease aims at regulating blood pressure so that the functioning of heart gets easy .The herbs also work towards removing plaques from the walls of arteries to maintain a constant blood flow. This formulation is combination of Arjuna, Ashwagandha, Brahmi and Shankhapushpi. All these together support nervous control and strengthen heart muscles. Ashwagandha or Winthania Somnifera also known as Indian Ginseng works in managing blood pressure and diabetes. It helps in relieving stress and anxiety thereby reducing the chances of blocked arteries. 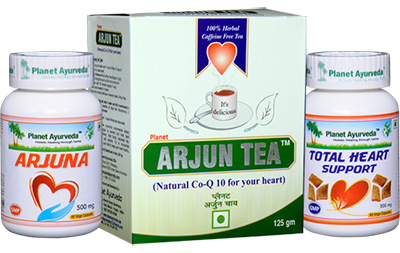 Arjuna Tea contains the herbal powder of Arjuna to support heart muscles, blood vessels and circulatory system. Arjuna Capsules contain standardized extract of Terminalia Arjuna or bark of Arjuna tree which is best in managing all heart problems and giving strength to the ailing heart along with controlling cholesterol levels. The bark is rich in natural oxidants. Along with these Planet Ayurveda also offers Gotu Kola Capsules that support blood circulation and balance the three doshas in the body. These are good for heart as well as brain. All the products are 100% safe and natural, free from any chemicals, additives, fillers or yeast. Cinnamomum Zeylanica or cinnamon helps in lowering cholesterol levels and fighting symptoms like vomiting and nausea. Its usage reduces shortness of breath and strengthens the heart muscles. Boerhavia Diffusa is another herb which is beneficial in relaxing heart muscles. It eliminates toxins from the body due to its diuretic properties. Herbs like amalka, kutki, punarnava and triphala are also very useful in this problem. Other herbs that can be used are turmeric, garlic, ginger, fenugreek, ginko, hemp seeds and cardamom. Coenzyme Q10, Omega 3 fatty acids, green tea, magnesium and potassium supplements are advised to be taken in this problem. Turmeric powder mixed with gooseberry extract can be taken after food to help control cell deaths. Gold Bhasm is very beneficial in providing vital strength to the heart muscles and restoring normal functioning of the heart. Lifestyle change by including regular exercise like walking or joggin, fresh air, less stress and healthy eating habits is the key to treat any kind of heart problem. Yoga and Meditation are good to relieve stress. Quitting smoking is the most important. It is equally important to control conditions like high blood pressure, high cholesterol and diabetes. Getting plenty of sleep is very important in fixing this problem as sleep deprivation leads to depression and blood pressure problems which increase the risk of heart disease. Taking flax seeds in diet either as flax seed oil or just as seeds helps a lot. It is advised to take 2-3 cloves of garlic 2-3 times a week. Lemon dissolves fat that causes blockage. So it is highly recommended to drink lemon juice everyday without adding sugar or salt. Avoid iodized salt. Cayenne Pepper is good for unblocking the arteries. It is important to avoid foods rich in saturated fats and trans fats as they cause rise in bad cholesterol levels that gets deposited in arteries in the form of plague. Being obese leads to higher incidence of problems like diabetes and hypertension. One needs to take low fat, low salt diet which is rich in fruits especially pomegranate, apples, grapes, papaya and vegetables like spinach ,cabbage, cauliflower, kale, onions, mushrooms, and broccoli and whole grains. One can take peanut butter, coconut oil, extra virgin olive oil, linseed oil. Artichoke, cocoa, barley, red yeast rice and oat bran are also beneficial in clearing blocked arteries. The intake of bottle gourd soup is highly recommended. Eating one or two servings of fish is also beneficial. Fast foods, soft drinks, foods with artificial taste makers should be avoided. It is also recommended to avoid all foods that promote inflammation like corn and soybean oils, all pasteurized and conventional dairy products, refined carbohydrates, meats etc.